Carnival Legend recently achieved a unique distinction within the Carnival Cruise Line fleet – traveling the furthest distance between two separate ports of call when it recently called at Fiordland National Park on New Zealand’s South Island – more than 11,000 miles from its northernmost port, Reykjavik, Iceland, which it visited in 2013. 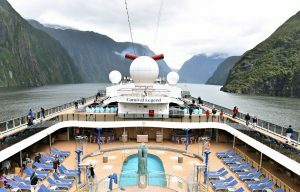 The visit to South Island was part of a recent 10-day cruise from Sydney, part of Carnival Legend’s seasonal program from Down Under. Suffice to say, Carnival Legend is a truly a globetrotter, visiting more than 110 ports throughout the world – from Airlie Beach, Australia, to Zeebrugge, Belgium, and just about everywhere in between – more than any other vessel in the Carnival fleet.